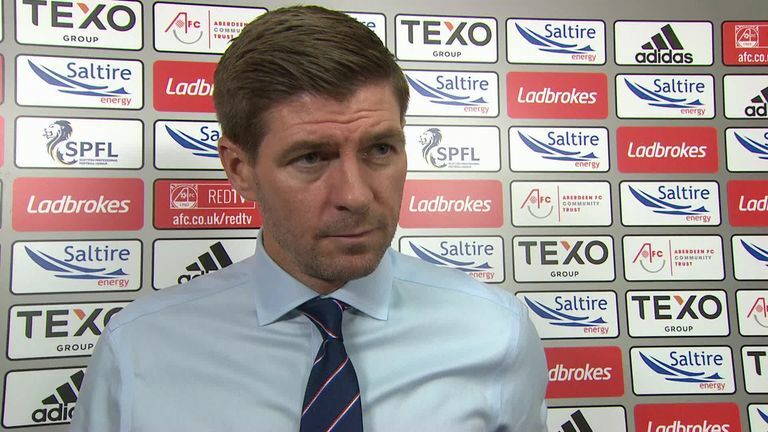 Steven Gerrard said Rangers were a "class above" Aberdeen after seeing his 10-man side impress at Pittodrie but concede an injury-time equaliser. The Gers were within three minutes of victory against one of their biggest rivals for a Scottish Premiership title tilt this season but for Bruce Anderson's late equaliser, which cancelled out James Tavernier's first-half penalty. Their performance was all the more impressive in that they had been a man down since the 12th minute, when Alfredo Morelos was sent off for kicking out at Scott McKenna. After the game, Gerrard was bullish in his praise for his side, both for their performance in the game and perceived superiority over the Dons. He said: "I thought we were magnificent. I thought we were very good with 11 men, I thought we were even better when we went down to 10. Aberdeen didn't have any idea against us. "For 93 minutes it was perfect, I'm gutted for my payers we conceded so late on but we're a class above Aberdeen. "It's frustrating because we put in so much effort, every single player to a man was excellent tactically. We were very good, very professional. "Aberdeen only had one idea, to lump it in the box, and I'm pleased with the players, I'm delighted and I can't go away from here disappointed with any of them. Rangers' James Tavernier (left) celebrates his penalty opener against Aberdeen with Ryan Jack. "I thought we were better with 10 men so at half-time I said to keep doing what we were doing, and try to hurt them again when the ball and there were 2-3 occasions we could have got another goal, but anyone who was at this game today must know that we were much better than them." Gerrard added the club would consider whether to appeal Morelos' red card, the first of his professional career, and one which will see him ruled out of games with St Mirren, Motherwell and Kilmarnock. He said: "You leave the referee with a decision if you kick out, but the disappointing thing is he has been barged clearly and whoever's spotted the red card should have spotted them too. That's the disappointing thing." He went on to further question the officials in his press conference, saying: "It seems like the world is against us but we'll make sure we get better for that because it looks like some more decisions will go against us as the season goes on. "We need to try and use it to our advantage. It's not just today, I believe it's been happening for seasons. That's just my opinion." Get Sky Sports' dedicated football channels with our new season offer to watch over 500 live games this season. Find out more.